Taking a look at board games playable with either one or two players. Thank you for checking review #86 by Cardboard Clash. My aim is to focus on reviewing board games and how they play for two people and, on occasion, how they play for one person. Because my wife is my primary gaming partner, a lot of consideration goes into finding those games that play well with 2 players, and we typically prefer to find those games that do not require a variant (official or otherwise) in order to play it with just the two of us. Haven is a board game designed by Alf Seegert that was published in 2018 by Red Raven Games. The box states it plays 2 players in 30-45 minutes. The mystical forest has been home and haven to beasts, spirits, and forgotten gods for thousands of years. While the Haven Guardian slumbers, a nearby human village has grown into a city, hungry to control the powers of the forest. Can the forest creatures discover enough potent lore to defend their ancient home from the oppressive city — or will the city use this lore to power their machines and turn the forest against itself? The battle for Haven begins! In Haven, you and your opponent battle for control of a mystical forest. The Haven Guardian, spirit of the forest, sleeps deeply and can no longer protect its kingdom. One of you controls the city in an effort to master the vulnerable forest using “stone lore” and machines. The other plays as the forest and its creatures who defend their home with the aid of “leaf lore” and forest spirits. To obtain the power needed to oppose your enemy, you must send seekers to compete for the lore controlled by elementals, ancient beings who bestow the lore on those who seek it. Seekers also engage in combat for control of shrines on the board, scoring you bonus points if you occupy a majority of shrines surrounding forest havens. When one type of lore is depleted or one elemental has left the board, the Haven Guardian awakens and the player with the higher score masters the forest — or defends it from harm — and wins the game. Asymmetric games are always going to catch my interest, and this one does it well enough. There are a few differences on each side in terms of the card distribution, and these are where the differing of strategies comes into play. Especially since you’re resolving for two things with every battle: weaponry for control of the Shrine being fought over and Lore for control of the Lore Token. The City is favored in weaponry for overall distribution in their Seeker deck and wins ties for that category, while the Forest has a stronger Lore base available and wins ties for that category. While both are important to secure end game points and bonuses, it is good to go in knowing where you are stronger so you can focus your strategy overall around that aspect. This game rewards planning ahead, as there are three different decks to draw from for each player, and all of them are important in different ways. Because you must play an Offering at the end of each turn, that becomes the biggest choice after the first few turns, as it will become mandatory to draw an Offering card if you have none in your hand. And if you wait until your hand is empty and take that draw at the end of your turn, you will forfeit control of where you play an offering or will possibly need to spend both draws on this deck in hope of catching the offering you want (or avoiding the one you really need to delay). Couple this with each Offering deck having three “play immediately” cards in there, one for each elemental, and those Offering draws could potentially trigger the resolution of an elemental now instead of at the end of your opponent’s next turn. Speaking of resolution, I like how the other player (usually) has the chance to react on their turn before a triggered elemental resolves. Generally you’ll have time to see the lines getting drawn on all three fronts as the turns go back and forth, and have one last chance to steal one or both victories when your opponent drops that third Offering down. Speaking of resolving, there is another great element at work here because the loser of the combat gets to choose the next Haven that elemental will move to. Even better is the opportunity to keep one of your Seeker cards in play at that Lore Token if you end up losing both the combat and the Lore resolutions. In a game where actions are few on your turn, being able to keep a card out as a consolation prize can be really critical for winning the next resolution there. The Lore Tokens have numbers on them, which you might think are their victory point value. You’d be wrong, as each token is only worth 1 point (but the higher sum on Tokens collected at the end for each type will get bonus points). That number is the maximum Lore value you can have at a Lore Token battlefield on your side. Which makes playing a random Seeker a risky move at times, as a Lore Value that is too big could possibly leave you in a position to lose it all. As per the norm with anything by Red Raven Games, the artwork on here is phenomenal. Seriously, this is a game that is simply good to look at. The Lore Power cards, in general, are hit or miss on their usefulness. They come at a pretty high price, since you not only need to spend a draw to take one, but then also spend an action on a future turn to play one. Drawing a Lore Power means you are seeing fewer Seeker cards in your hand, or risking a future turn where you might be forced to play whatever Offering card you draw blindly. This payoff is acceptable when you draw a Lore Power that is useful to your situation – but there are definitely times when they simply sit and clog a hand for most of the game waiting for that “right time” to use that action and it never comes. I love them in theory, and I am glad they are part of this game, but sometimes the better play is going to be to draw another Seeker so you can have more choices and play them face-down onto the Lore Token. Minor nitpick here, but the Elemental Standees can be annoying because they can make it easy to miss seeing another Shrine location adjacent to a Haven. I’ve had this happen several times already where I thought a resolution was to ultimately gain control of a Shrine and a Haven and been wrong. I feel like the Havens should all have an odd number of Shrines attached to them. The ones with 4 Shrines are by far the hardest to complete, because you need to claim 3/4 of the Shrines in order to get that Haven. This means that the end of the game typically has 4-6 of the 10 Havens actually under a player’s control, even though all but 2 Shrines have been claimed. Haven is one of those games that you cannot figure out which is more appealing: the stunning artwork or the brilliant gameplay. This game is delightful because it contains them both, all packaged into a tight 2-player experience that plays in 30-45 minutes. That makes this a prime candidate for a game night during the week when we are pressed for time, as we often are these days, or for a best-of-three challenge because we’re almost always looking for a repeat play once the first match is finished. At every junction of the game there are decisions presented to the player that can add up to serious consequences. Deciding what unit card to deploy and to which of the three elemental fronts, or whether to gamble on one from the top of the deck, can have incredible impact on the tactical and strategic outcome of the game. Deciding what two cards to draw, and when to take those Offering cards in order to maintain some decisions about which is played at the end of your turn, is such a crucial choice each and every turn. Having those three decks remain separate, rather than all shuffled together, is part of what provides these tough and meaningful decisions. Add in the timing of resolving each battle for the Elemental, combined with the light area control flavor from the board, and you have all the ingredients for a memorable game. There is a delightful balance of everything in Haven. Not balanced as in one side versus the other, although they definitely feel like there is a tight balance there, but balance regarding how everything interlocks together. Most frequently a game as ambitious as this, with a smattering of a few mechanisms into the gameplay, has parts that either feel bloated and unnecessary or parts that feel underdeveloped to the detriment of the gameplay. My experience so far with Haven is that everything meshes together so well to provide a fun, memorable, and unique game that I cannot wait to get back to the table once more. In an era of Marie Kondo auctions flooding the marketplace as people evaluate the bloat on their shelves, Haven stands strong with a few other games in my collection that are remarkable and highly unlikely to ever be cut from my collection. This game holds a high spot on my list of 2-player only games, especially given the reasonable footprint and quick yet engaging play time for Haven. And let’s not forget the incredible Ryan Laukat artwork, which only enhances the entire package of the experience. This game is almost as far from the chopping block as a game can be on my shelf, and is surprisingly my favorite Alf Seegert game to date – an honor I expected Fantastiqa to hold – all of which should testify to how much I truly enjoyed this game. If you are on the lookout for a great 2-player game, this is definitely one to consider and is among the best games released in 2018. Valentine’s Day is a traditional holiday where we associate celebrating the day with flowers or chocolates and having a fancy dinner at a restaurant. This year allow Button Shy Games to help make your romantic date a little more memorable with some of these portable, fast, and fun games that the two of you can play while waiting for your food to arrive. Or that you can stay up late playing long after the children have gone to bed. With games that fit in your pocket, these Button Shy titles make the perfect pairing for any Valentine’s Day situation. Arcane Bakery Clash is a resource management game, where your resource is time – and not just the roughly 30 minutes it’ll take you to play the game. Specifically, time to cook the magical treats that you will use against your co-worker. I dare you to find a more thematically-appropriate game to play during dinner. In Arcane Bakery Clash you can choose 2 actions per turn, and you will either put a recipe card in the oven, peek into an oven, turn up the heat, or take a recipe out of the oven. With these actions you will bake new treats that are used to either reduce your opponent’s health, heal yourself, or allow special actions. Show your spouse how much you care by reducing their health to 0 and become the most talented baker in Arcane Bakery Clash. Circle the Wagons is a card drafting, card-laying game that can be played in about the time it takes for appetizers to arrive. Three cards are flipped to form the scoring objectives, and the rest get placed in a nice circle – think of it as a circle of trust – and you’ll take turns going around said circle drafting cards. Don’t like the next card in the line? You can skip ahead to take any card, but the cards you skip immediately go to your opponent to add to their little boomtown. Once all cards have been drafted and added to your towns, the objectives are scored and the largest groups of each of the six terrains are scored to determine the winner. Playable in roughly 15 minutes, Circle the Wagons will leave you wanting to reset for a rematch again and again. Perhaps you’re among the crowd itching for the next superhero movie to hit the theaters. Well, you may find that HeroTec is the perfect game for you and your significant other. In this game you’ll be competing to outfit a superhero client who requires four types of items: a gadget, a costume, a vehicle, and a lair. Players will race to be the first to complete the job, while also trying to build the best tech. In HeroTec you must outfit your superhero client by first drafting cards and placing them directly into your Workshop. There you will use the card for its resources, trying to build items for your Showroom. Each card is multi-use, featuring level I, II and III resources, as well as a special ability that allows you to build a very unique engine that will guide you to victory. Once a player has all 4 items in their showroom, it’s time to bring out the superhero and see which HeroTec employee makes the best impression. Kintsugi is the Japanese art form of repairing broken pottery with gold lacquer, to show the imperfect history of the object, and to affirm that it is better for having been broken. Therefore in this small tile-laying game you are repairing a piece of pottery, then playing the role of an art critic for your opponent. You can win by being a better artist, being a better critic, or both! In true minimalist tradition, the lowest score wins making it an interesting twist on most scoring objectives in games. If you are looking for something with a more abstract, cultural theme to pair with your meal you may find that this caters to your tastes. Perhaps you’d like to put on your favorite Space Opera film and recreate the epic struggles between the forces of good and evil while watching them play out on the screen. Allow me to introduce you to Liberation, a game that plays out a miniature rebellion of galactic scale on your tabletop. An asymmetrical game of cat and mouse, the Dynasty player expands their web of power, occupying and exploiting planet cards, while the Liberation player strikes from the shadows, sabotaging the Dynasty’s hand and performing daring missions. Can you stall long enough to cycle through the deck 3 times, earning enough support to topple the Dynasty, or will you scour the galactic map, tightening the noose around the secret base of the Liberation to attack and destroy them? Be warned, though: you may find that you are too engrossed in this little game to pay much attention to your rewatch of that Space Opera. At least it provides a thematically-appropriate source of sound effects and soundtrack. In Mint Julep, you’ll be attending a horse race. You will draft cards, place bets and then manipulate the race in order to ensure the horse that you want to win ends up finishing the race in a top spot. Be careful where you place your bet because the odds might be against you! Final scoring is based on where horses start in the race (horses starting in lower positions are worth more points), where horses end in the race (more points earned for higher place finishers), and when a bet was played (with later bets being worth less than earlier bets). Can you outwit and outbet your significant other in this equestrian experience? Place your bets on Mint Julep and you’ll end up with a winner in your pocket. Potions Class is an explosive game of set collection a bit of press your luck mixed in for good measure. You will take turns adding a card to a potion, your reserve and your opponent’s reserve. These are done one at a time, in whatever order you choose, but you won’t know what the next card will be when making these decisions. If you complete a potion, you claim it as yours, but you need to watch out for your opponent’s reserve. It might be just enough to push them over the edge and complete a potion that you were working on. Potions Class is for two players, and plays very well with young kids in case you want to get a little bonding time in with the little ones before putting them to bed. It also works quite well as a relaxing game to wind down your evening and pairs well with liquid potions for your own consumption. In Sprawlopolis you will work together to build a new city by playing a card from your hand to grow the city. Much like Circle the Wagons, three cards will be flipped over to show the scoring conditions for that specific game – however, this also determines the minimum score you’ll have to achieve in order to claim victory. The two of your will have to communicate and plan without revealing your own cards in order to most efficiently develop large areas in each of the 4 zone types. However, each road will cost you points in the end. Watch a sprawling metropolis grow as you cultivate the expanding landscape together in Sprawlopolis. For those whose Valentine’s Day is spent alone, we have some excellent games for you as well! Circle the Wagons, with its Lone Cowboy expansion, and Sprawlopolis are both excellent solitaire experiences. But you may want to launch into the stars and explore the vastness of space in our solitaire-only Twin Stars Adventure Series I. Two cosmic adventurers are in a tricky scenario and must work together. By rolling and manipulating dice for special abilities and combos, you can be the one that guides them to victory. This group of 6 scenarios and 12 characters, makes for 396 unique combinations and tons of solo replayability to last you long after the holiday ends. No matter what is in your wallet, these games are sure to satisfy a variety of gaming tastes this Valentine’s Day. With all base games being priced around $12, expansions adding only a few additional dollars to the overall cost, and free shipping on orders over $25, there is no better time than now to start, or expand, your Button Shy collection with some of these games that play well for two. Thank you for checking review #83 by Cardboard Clash. My aim is to focus on reviewing board games and how they play for two people and, on occasion, how they play for one person. Because my wife is my primary gaming partner, a lot of consideration goes into finding those games that play well with 2 players, and we typically prefer to find those games that do not require a variant (official or otherwise) in order to play it with just the two of us. **Note: The publisher provided a review copy in exchange for an honest review. Holmes and Moriarty is a board game designed by Brad Lackey and Joshua Tempkin that was published in 2018 by Escape Velocity Games. The box states it plays 2 players in 30-45 minutes. -Sherlock Holmes to Dr. Watson in Sir Arthur Conan Doyle’s “The Final Problem”. Professor Moriarty is almost ready to enact his nefarious plan! Sherlock Holmes suspects that something is about to happen, but he doesn’t know the details. As Moriarty’s crimes set the final pieces into place, Holmes desperately searches London for the clues he needs to foil his nemesis. London’s greatest intellects go head to head in this intense battle of wits! Holmes & Moriarty is an asymmetric two-player drafting game in which players take on these iconic roles. Over a series of hands, players try to win “cases” by drafting crimes and clues drawn from Conan Doyle’s stories. Players mark their winning positions on the scenario board. If Moriarty can score three in a row, he can activate his master plan for the win! If Holmes can foil Moriarty’s plans, he wins! This game has a clever decision in having each player play out cards face-down in two rows and having the card in one row be key for Holmes and the other be key for Moriarty. It opens things for some interesting decisions that need to be made in terms of where your stronger cards should go – not only to try and win the contest in that case but also to be able to mark on the board where you need. The game immediately feels unbalanced, with Moriarty taking early victories and placing out tokens on the board. But then you get two rounds in and realize suddenly the Moriarty player needs to narrow their focus on what cards they win with, meaning it is harder for them to score meaningful victories. Every game I’ve played has seen the Holmes player come roaring back in a strong way to make things interesting and place the outcome in doubt. The box has a nice magnetic close, and top flap is repurposed for the spatial map for this game. It could have easily been a thin piece of cardboard – and one could argue it would be more convenient that way – but I happen to like that extra touch in this small game. There is incentive to win big in a round, as players gain bonus placements if they fulfill certain conditions. Moriarty wants to win the majority of cases each round for bonus tiles – although those bonus ones are placed by the Holmes player. Holmes wants to win his aligned case cards to get extra tiles out to block the Moriarty player. This layer of asymmetry adds a nice touch. This game is relatively easy to teach, as most gamers will have some familiarity with trick-taking card games and with the spatial aspect that resembles tic-tac-toe. The most difficult concept I’ve had with this has been the difference between the two rows being played, which one is important for each side, and how only one of those has the wrap-around effect while the other will have a trump suit. The comfort of some of these familiar mechanics will make this an easy game to teach to newer gamers while demonstrating a stronger depth of strategy that modern board games will provide. I don’t know what sort of game I was expecting on this one but, like Holmes: Sherlock and Mycroft, this is not the Holmes game I was looking for. While it definitely feels more thematic in ways than Sherlock and Mycroft, this still could have any number of themes substituted in without missing much of a beat. I love the theme and the concept in this game. It has all sorts of potential, and sounded so amazing from the description. Maybe I set my expectations too high, or maybe I should have taken a closer look at the actual gameplay on this one. Sadly, the biggest problem this probably has is that it simply isn’t a good fit for my gaming tastes, something that makes it inevitably suffer in spite of its strong points. Holmes and Moriarty is one of those games that, if I was a bigger fan of trick taking games or other more standard card games, could be a stronger hit. I can appreciate all of the cleverness in the game, just as I do for a game like The Fox in the Forest or Custom Heroes, but it’ll never be a game that I think about pulling off the shelf to play because it is not my type of game – something I’ve only recently come to terms with. Did I appreciate the game? Absolutely! Have I enjoyed my plays of the game? Without question. But is this game for me? Unfortunately, no matter how great the theme is and how well they did the mechanics of this game, it is not for me. This game is clever in ways I definitely appreciate. There is a really solid design in place, and this game can serve as an excellent way to bring more traditional gamers to explore the modern board game scene. This is a fast and enjoyable 2-player experience that presents a ton of crunchy decisions. I love the asymmetry in the game, and how each side functions in very different ways. It has a clever balance where Moriarty feels powerful really early and then the edge shifts sharply to the Holmes player as the game goes on. Having the cards get played into two different rows, each being resolved in a different way, is brilliant. There is so much that is worthy about this game that, for the price and the size of this one, it is absolutely worth taking a shot on the game. If you enjoyed games like The Fox in the Forest, or have fond memories of playing games involving numbered cards, this one might really suit you well. Thank you for checking review #82 by Cardboard Clash. My aim is to focus on reviewing board games and how they play for two people and, on occasion, how they play for one person. Because my wife is my primary gaming partner, a lot of consideration goes into finding those games that play well with 2 players, and we typically prefer to find those games that do not require a variant (official or otherwise) in order to play it with just the two of us. Anthelion: Conclave of Power is a board game designed by Daniel Solis that was published in 2019 by Button Shy Games. The “box” states it plays 2 players in 20-30 minutes. The sun is setting on one of the most devastating battles the Pocket Universe has ever seen. After years of fighting, it is becoming clear that this war will not be won on the strength of military victories alone. The leaders of the Dynasty and the Liberation turn their attention to some of the most influential figures in the galaxy to strengthen their cause. Who will be able to consolidate their power, gain new allies, and turn old foes to their side? Who can form a Conclave powerful enough to gain control of the Universe? Anthelion is a game for 2 players who choose two unique special character abilities on their turn to manipulate the locations of the characters in play. Players seek to pull characters from all factions, good, evil and neutral to their side of the table (their Conclave), or push unwanted characters to their opponent. The player that can amass ten points of influence by getting enough characters to cross all the way to their side of the table will be declared the winner. The gameplay in this is an interesting tug-of-war between the two sides. In almost all aspects this game is equal, as there are very few Petition actions that are exclusive to a specific faction. Obviously there are faster paths to the ten stars than others, and most plays will likely see each side focusing a little harder on their specific faction since those offer an extra star when brought into their Conclave. But they are not limited to those decisions, which opens the game up for some really interesting gameplay. The powers on the Character cards are all unique, making this a game about tactical decisions based on who is available and their current location. There is room for more strategic arcs in the game, but much of the tempo will be dictated by what is available at the moment rather than who you’re hoping to see appear. The artwork in this game stands out on the table. It is everything I want in my Space Opera version of a board game, and it helps make every character in the deck feel like they have a deep, unique backstory to tell. There’s a lot of decision space contained in the 18 cards in this game, which was one of the things I really liked about Liberation when I played it last year. Most people expect a light, simple filler game when hearing about these smaller game sizes, but this one definitely delivers an extraordinary amount of meaningful decisions among the small components and footprint of the game. This requires a little more space than Liberation, but this will go well alongside it as a game I always want to take with me when I am on the go. A small decision in the rulebook is really key: you cannot completely undo the previous player’s turn. It is possible to get in an endless loop of moving the same person or two back and forth, but this key rule helps to prevent this from happening. The board state is always going to change, at least a little. You can undo some of what they did, but never their entire turn. Which also opens up the key decision: which of their moves do I counter, and what progress would I like to accomplish myself to provide them with the same type of difficult decision? The game, in our first plays, has the ability to overstay its welcome. Once both players are within striking distance, it becomes a slow push and pull to try and be the first one to get that 10th star without opening it up for your opponent to get there first. With more plays, this may get better as part of the issue stems from the cards themselves. Yes, you may find an issue because every card is unique in what it can do. Which means you may spend a lot of time reading what everything does as you try and figure out what two actions you want to do. And then the board state changes and you’re back at square one of puzzling out the next turn. This game can cause AP in players. It will have pauses during those first plays while you familiarize yourself with the cards. But this game opens up in a great way once you get past those learning curves – making it play much faster overall and providing a better experience for both players. This isn’t a fault in the game, but something worth knowing when you go in. Those first plays will take longer than you want because of the reading. But with only 18 cards, you’ll get them down eventually and things will improve. Anthelion: Conclave of Power is a game that impressed me from the first play. It contains so many excellent decisions in a tug-of-war style of game, which helps it to stand out from the crowd. I’ve never played Avignon: A Clash of Popes, but my understanding is that it uses some of the same core concepts from there but cranked to 11. If that is the case, I’m even more interested in trying Avignon than before because of how much I enjoyed Anthelion. This isn’t just a filler to pull out when you need to pass the time at game night. This is a game you could sit down and play a few times with a spouse, or gaming partner, and feel satisfied that you played something which rewards strategic decisions. Like all Button Shy games, this one is super-portable and can be played almost anywhere – you’ll need room for a 5 x 6 grid of cards essentially, and most tables should be able to accommodate that. While I wish there was more room for long-term planning and strategy in here, that doesn’t detract from the great experience found in this game. Anthelion: Conclave of Power has the power to stay on the table for repeated plays – at least once players are more familiar with the various cards and what they do. I’d like to think that two really experienced Anthelion players would make for a really interesting match in this one, each trying to edge in an advantage over the other player. I was a day one backer for the game, and with good reason. If this game was the standard 18-card game with the plan for a single small expansion to ship with the game, that would be good enough to warrant adding it to a collection. But there are several expansions in the works for this game, and I truly cannot wait to see how each of them alters the game in meaningful ways. This game is helping to revolutionize the way I look at the potential of that 18-card design space and gets me excited to try more of the games in the Button Shy line of games. Thank you for checking review #78 by Cardboard Clash. My aim is to focus on reviewing board games and how they play for two people and, on occasion, how they play for one person. Because my wife is my primary gaming partner, a lot of consideration goes into finding those games that play well with 2 players, and we typically prefer to find those games that do not require a variant (official or otherwise) in order to play it with just the two of us. **Note: A review copy of this game was provided in exchange for an honest review. Professor Treasure’s Secret Sky Castle is a board game designed by Jason D. Kingsley that was published in 2018 by Level 99 Games. The box states it plays 2 players in 15-30 minutes and has a BGG weight rating of 2.00. That dastardly Professor Treasure is at it again! This time, he’s stolen all the world’s treasures and hidden them away in a secret floating castle! As an intrepid treasure hunter, you and your friends have finally managed to track down the castle. However, another team of explorers is already here! Professor Treasure’s Secret Sky Castle is a competitive puzzle game in which you and your opponent race to find keys, unlock treasure chests, and collect priceless treasures from around the world and history! Send out your team of treasure hunters, each with their own unique way to explore the castle. But beware! Your opponent will try to thwart your plans and grab the treasure for themselves! None, as this is a 2-player only game! It will never be a favorite mechanism, but I really like the action programming in this one and how it is handled. Both players have the same 8 roles, of which 2 are randomly removed (potentially making both players using a different 6 roles). After the tiles are placed for the map, the players simultaneously break their cards into groups. The first player of the round makes 3 groups of 2, the second player makes 2 groups of 3. The the players take turns putting out a grouping at a time onto the board. I really enjoy this aspect of the game, and need more games with something similar. Pairing with the programming is that all characters have a determined order of activation, with the 1’s triggering first and ascending up to the 7’s. The first player’s card goes first when both players have the same card# in play. This adds a good, strategic depth to not only the placement of your cards, but also how you group the cards, when to put that group out, and more. I love that all 8 cards are unique in how they can be placed and what they do. Some are placed directly onto a tile and take that tile. Some are placed outside a column or row and can take any tile in that column or row. Some can shift tiles around, or thieve tiles as an opponent takes one. Since you don’t know up front what 6 cards your opponent is able to use in a round, the planning at the start can be an interesting game of trying to decide what to place and where with those first cards. Scoring in this game is far more intuitive than I expected from reading the rules. Since it is all done at the end of the game, there is no bookkeeping to do along the way. And since you keep the tiles you earn, there is no tracking it that way. There is also a pair of great player aids with how all three things score. Overall, well done. This game wouldn’t be as good without a measure of pressing your luck, and it comes here in the form of skeleton keys. You see, chest are worth a lot of points but need keys (1-4 per chest) to open them. Each key you have can be used once per round, which means if you need more keys than you have available you have to take Skeleton Keys to open that chest. Not only are they worth negative points (after the first one you take), but they become increasingly more impactful if you take too many (for instance, the 5th key would be worth -4 points, the 6th worth another -5 points) so you need to decide how aggressive you want to be on taking chests. This game could have been done using just cards. Given the production by Level 99 Games, it wouldn’t have surprised me to see all cards in there. However, the tiles in this box are fantastic quality and enhance the experience of building the map each round and the stacks made of tiles as you collect them is fun, too. Not enough good can be said about the artwork done by Fabio Fontes and Laura La Vito at Level 99 Games. There are big names in the board game art world, but these two (and Nokomento) are severely underrecognized as a whole. The art in this game is crisp and clean, and the graphical design is intuitive and complementary of the game design. This game has a little variety because you’ll only use 6 of the 8 cards each round and there is a good chance a few tiles won’t appear. But how I wish there was a little beyond that in this box – a few “advanced” roles to mix in after some plays, or more tiles than the exact number you’d need as a maximum. There’s a little room here to add a mini-expansion in the future, maybe adding 5-6 tiles of a set together where if you get 1-2 of them you lose points and move into some strong points if you get 5-6 of them. There is a small problem with the number of rounds in this game and the advantage it provides to the player who goes first. Since the first player in a round places their final cards last, they can make those last decisions with perfect information about what their opponent is doing. Granted, this requires grouping well and saving the right pair to place last, but this feels like a position of power. So with 3 rounds, the start player goes first twice in a game. Yet 3 rounds is the perfect number for the game, as it would get ridiculous (or really uninteresting) in a 4th round, and would end prematurely in the 2nd round. So while I don’t have a good answer for how to fix it, and it isn’t something that breaks/ruins the game, it definitely feels like the start player gets a small advantage over the course of the game. I hate the decision to have the rulebook to be a folded oversized sheet of paper, essentially. It isn’t really feasible to have it unfolded on the table while playing, meaning you need it folded up beside you and will need to unfold it to look rules up. I’d much prefer a small booklet, which would also be good for referencing things in an organized manner. When I got my review copy at Gen Con, I knew only two things for sure about this game: it has an awesomely unique title and was produced by one of my personal favorite publishers. I also knew that my wife had yet to find a game (other than, finally, Argent: The Consortium) that she really liked from Level 99 Games. Enjoyed enough to tolerate? Sure, she hasn’t hated anything from Level 99 yet, but she hadn’t instantly liked any of them to want to play more. I’m happy to report that she really liked this one, an opinion that mirrors my own feelings about this game. In fact, one of my favorite things about this game is that it uses a mechanic completely missing from our collection: action programming. I’ve played a very small handful of those games, and I think the only one my wife has tried has been How to Rob a Bank (leave me recommendations on non-cooperative ones to try in the comments, please!). So I was very interested in how this would pan out when it hit the table for us. This is a game that is going to exist in our collection for the same reason that games like Holmes: Sherlock & Mycroft do – they are games that will never be our favorites, but are unique enough and small enough that we’ll want to pull them back out several times a year for a game or three (likely a best-of-three series). For the price on this one, there is plenty of game to keep us coming back for years to come without it growing stale. While it would be great to see some more variety in the cards or tiles, the simplicity of everything in here allows the game to get out of the way and open things up to strong, creative play. I knew this was a gem when, during our first two plays of the game, we were both complaining about moves the other person made…in a good way. You’re going to get in each others’ way, resulting from clever (or lucky) placement or selection. If we had our own “Glory to Rome” board, it’d get filled with tallies over the course of a best-of-three play of this one. And really, that is what I want from a filler game: a game that fills a unique niche in my collection, has quick setup/teardown time, and provides a very thinky and competitive game experience against my wife. For the small box this comes in, at a great price point, this is a quality 2-player game from a company that puts out a lot of excellent 2-player games. While all of their games may not appeal to every couple, this one will have a more universal appeal than most. 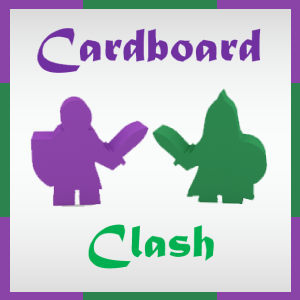 Thank you for checking review #74 by Cardboard Clash. My aim is to focus on reviewing board games and how they play for two people and, on occasion, how they play for one person. Because my wife is my primary gaming partner, a lot of consideration goes into finding those games that play well with 2 players, and we typically prefer to find those games that do not require a variant (official or otherwise) in order to play it with just the two of us. Exceed Fighting System is a game designed by D. Brad Talton Jr. and was published by Level 99 Games in 2015. The box states that it can play 2 players and has a 5-30 minute play time. Bring the fast-paced action of head-to-head arcade fighting games to your tabletop with the EXCEED Fighting System, which features fast-paced, intuitive mechanisms and gameplay that’s accessible to gamers and non-gamers of all skill levels. Choose your fighter from an ever-growing roster of diverse characters, each with their own deck of special moves and supers. Play your cards to unleash fireballs, dragon punches, and deadly combos on your opponents! Titles in the EXCEED Fighting System come in one of two forms: standalone games that contain decks that allow two players to compete against one another, and individual decks. The standalone games are being released in “seasons”, with each season containing sixteen fighters from various franchises or worlds that are packaged into four-character boxes. Any deck can be played against any other deck, allowing you to compete across seasons and across worlds. Season 1 of EXCEED features the art and characters of Jasco Games’ Red Horizon, which was first featured in the UFS Collectible Card Game. Season 2 of EXCEED features the monstrous heroes and villains of Seventh Cross, an upcoming game world from Level 99 Games. A huge change from BattleCON is that it becomes a “you go, I go” system and not every turn will consist of an attack. There are other things to do, such as drawing more cards or boosting your next attack or even moving around the board, and these add some nice, small decisions for the players. Attacking spends cards, all other actions at the least gain a card at the end of your turn. So eventually you’re going to either need to do something other than attack or just spam Wild Swings. Wild Swings are what make this game exciting. Seriously. There’s something amazing about landing a strike that you couldn’t have otherwise done from your hand. I had a situation where I was 4 spaces away, my max range in my hand was 3. I gambled with the Wild Swing and flipped a card I didn’t even know existed yet that had a 4-6 range. It was an amazing feeling. I’ve also pulled off a finishing blow with a Wild Swing, as my opponent was at 4 health and both my hand attacks dealt 3. So I gambled on the Wild Swing and brought them down. Is it a reliable tactic to use often? No. But it is great to have that option for when you don’t have the right cards, or desire to keep your hand in-tact. I love how thematic it feels to need to land hits in order to use your stronger attacks. Every successful hit is added to your Gauge, which is essentially a currency you can spend. Each character has a few cards (called Ultra Attacks) that can only be played by spending Gauge. It can also be spent as Force, providing more for fewer cards. It is like your fighter is using momentum throughout the match to hit harder and (usually) faster than a normal attack. While they lack any finishers, these are a close enough substitute that it feels right. The Exceed mode on each character brings a nice decision into the game, as it also takes Gauge to flip your character. Gauge isn’t always easy, or fast, to come by. Spending 2-4 Gauge is a critical decision at times, as using it for Exceed will make it so you probably can’t afford an Ultra Attack. However, the continuous boost/change to your character might be worthwhile. Deciding when/if to Exceed is a critical decision at times, and one I enjoy having available. EX Attacks are a fun twist to add in there, yet another thing that adds some flair to the gameplay and makes it exciting. When you play a strike, if you have two cards of the same name you can put them both down. What this essentially does is add +1 to everything but range on the attack, making it faster, stronger, and provide more defense. This has been the difference between being stunned and making a connection on an attack, and is a simple yet wonderful tactic. There is balance in the game. Honestly, it felt like there wasn’t during my first two games as the fighters I used are polar opposites (one is all about ranged attacks, the other about being right next to the opponent). Yet as I played more, using the same matchup against the same opponent, that perceived disadvantage disappeared. Do they dictate some of the playstyle? Sure, which is the beauty of a game where there are currently 32 fighters, not counting bonus ones. You just need to find the one that resonates most with you. These things are worth mentioning even though all I have is a demo deck. These could be things that have been changed/fixed already and I just don’t know it. But here goes: The board is 9 cards. While it isn’t a bad thing, having a board (other than via purchasing a mat) would be a nice bonus. I understand the cost savings of this method but it also leads me to wonder if there is a way to track health in the box. No board or mat leads me to have to find alternative methods for tracking our health. I got my first introduction to Exceed: Fighting System at Gen Con from the Level 99 Games booth. I distinctly remember talking to Brad Talton while playing Temporal Odyssey beforehand, asking him how he felt Exceed and BattleCON could co-exist while providing the same concept of fighting game. I simply didn’t understand how this game could be different enough from BattleCON, a game I had already played and came to love, to merit consideration in a person’s collection. But Brad was right – turns out the designer of the games knows what he is talking about – this game is different enough to co-exist in a collection. Both of the games are going to scratch different playstyle itches. BattleCON is deep in tactical and strategic layers because you have a set of cards that are known to both players, and that are available in a cyclical system of rotation. This provides both its greatest strength and greatest weakness in the same blow, as it allows you to plan for every possible combination your opponent could play and to think ahead by several turns on your own moves. Exceed, on the other hand, has elements of both but is a lot heavier on the tactical side of things because it adds in randomness into the mix. You won’t always have the exact card you need for the situation, and the number of specific moves is finite in that deck. While it loses the ability to plan with perfect information, it gains a lot more emotional moments instead. Rather than doing well because you outplayed your opponent, you gain the thrill of connecting on a hopeless Wild Swing strike and drawing the exact card you need at just the right time for your circumstances. It provides more of a roller coaster of excitement and layers of tension that are sometimes lacking in the BattleCON match. All the while feeling like a brand new system that still feels as though it will reward the experienced player. My experience so far with Exceed is limited to two characters, those demo decks I picked up at Gen Con, and that is why I feel there is some value here in reviewing the system as a whole. This avoids diving into X is broken or Y is underpowered or Z is the best box to purchase because it has A in there. This is my taking a look at the mechanics of Exceed and providing a review of the mechanics alone. And that is enough. Honestly, it doesn’t matter as much about which box you pick up or which season of Exceed you purchase because the core of the game is great. I’m still not sure if I prefer this or BattleCON, and I don’t know that I will ever make that decision. I know players who are likely to prefer the open information of BattleCON and the feeling of outplaying your opponent to win. I know others who prefer a little luck in their game and will really dig the use of a Wild Swing as a mechanic. I enjoy them both equally. Which says a lot about Exceed, since my expectations were pretty low going into the game. It provides a faster experience, while opening up a lot more small decisions to the player because it is not just about pairing attacks every single turn. You can not only do smaller actions to help position your fighter or load your hand, but you can also Exceed to unlock your more powerful side and play EX attacks to boost your strikes. I love the tweaks made on this fighting system, and if you like a little luck in your game and a box that has an excellent entry price, then definitely check out one of the eight available boxes of Exceed. Hopefully you found this article to be a useful look at Exceed Fighting System. If you’re interested in providing support for Cardboard Clash so I can continue to improve what we offer, check out my page over on Patreon: http://www.patreon.com/CardboardClash. Check out more of our reviews at the following Geeklist and be sure to let me know what you thought of this game. This post is long overdue. Really long overdue. The campaign for BattleCON Unleashed is literally in its final hours, and it is one that I 100% recommend. Whole-heartedly. I believe in Level 99 Games and the work they are doing, and the BattleCON system is arguably the best 2-player only game out there for your money. Yes, better than my hyped Hanamikoji because of all the variability, depth, and replay value contained in even one box of this game (yet you’ll want them all). So go check out the campaign. Pledge if you want to – it’ll be great. You can get everything ever released from BattleCON, or just the newest stuff. You can’t go wrong either way, as BattleCON isn’t just fan service to the fighting genre of video games. What is in the box is a tight, fast, fun dueling game with a ton of strategy and tactics, complete with open information. It rewards new players, as well as mastery of the characters. Curious about my full thoughts on BattleCON? Check out the review I wrote for Trials of the Indines back in June. This month has been the hardest month in terms of time for me. I wanted a nice, long, complete fanfic to post up as part of their campaign. In my mind, I was still going to reach the end of it in time, but life is just too insane right now for me to dedicate the proper time and attention to make a polished product. So I’ll end this with a teaser – a very small sampling of what will eventually become a long, finished product. Something that I, and Level 99 Games, can be proud of. Even this scene has changed and expanded – but it will be enough for now. The lore in the World of Indines is incredible, and so much is unexplored that a writer could be content creating content for years and still have things to cover. “Whoa, the Rubara Keep is massive,” said Magdelina. She brushed a lock of hair aside and shook her head, her long pigtails swinging from the motion. “And it is very important that we succeed.” Kallistar marched forward, forcing her two companions to catch back up. “A trap?” Magdelina echoed, stopping in her tracks. Her gaze darted around the massive chamber, scrutinizing the shadows being cast by torches hanging from the walls and pillars. Vanaah looked up toward the ceiling where a pair of balconies stretched out over the chamber, but neither contained any signs of movement. Kallistar continued her determined stride forward, eyes fixated on the double doors ahead. “Kallistar, look out!” Magdelina shouted. Her companion continued her march onward. Two arrows converged upon the pyromancer in the lead. Magdelina clenched her fists and two luminescent shields formed in the air, traveling alongside Kallistar. The arrows bounced harmlessly off the shields and Magdelina banished the shields. “Finally,” Kallistar said as the double doors opened and waves of guards burst into the chamber. Spouts of flame burst from Kallistar’s fists, scorching the nearest guards. “We must remain vigilant,” Vanaah said as she readied her scythe. She swept the weapon in a wide arc, the crescent blade slicing the shins of a nearby guard. The stream of guards continued to flood into the chamber. Vanaah danced through their attacks, striking back mercilessly with her scythe. Kallistar burned with fury, her flames growing hotter with every blow the guards land upon her as she battles back the swarm. She laughs as a heavy crossbow bolt pierces her shoulder and sends a bolt of fire racing across the room to strike back at the assailant. Swords slashed through the air around Magedelina. She ducked under one strike and hopped aside to avoid a thrust. Thick blue tendrils of smoke rose into the air from a golden ball in her hands, growing thicker with every successful dodge. A blast of flame tore through the guards to Magdelina’s right and she rolled under another swing from the remaining guard. As she got to her feet, she spotted a flash of red hair beneath a black pointy hat. It disappeared beyond the open doors. “Hepzibah,” Magdelina whispered. Her companions were busy fighting off the guards. Kallistar looked like she was finally enjoying this quest for the first time since they embarked, and Vanaah was surrounded by a circle of troops. Magdelina knew Vanaah needed her help, but the mission had to come first. The fate of the entire world was in their hands, and the revival of Rexan would cast a shadow over the world. Hepzibah needed to be stopped at all costs. She walked across the room, the turmoil of battle remaining on either side of her. The double doors began to close and she dashed forward. The opening grew smaller and smaller as she approached and she dove forward, rolling to her feet on the other side as the doors slammed shut. She looked around but could see no one who might have shut the doors. Goosepimples spread up her arms and she turned to examine the dark hallways. LotR LCG Strategy: Where to go After the Core Set?